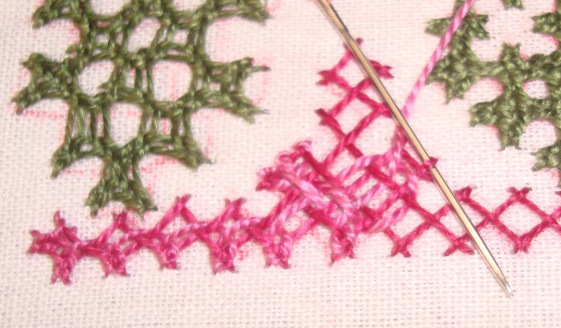 These borders are inspired by this week’s cross stitch edges posted on Randje per week challenge 2015. 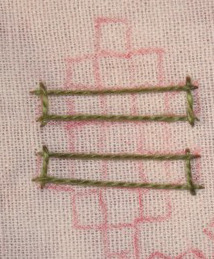 The simple kutchwork motifs are completed first. 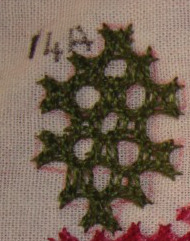 The first part of the anchoring stitch for the second motif. 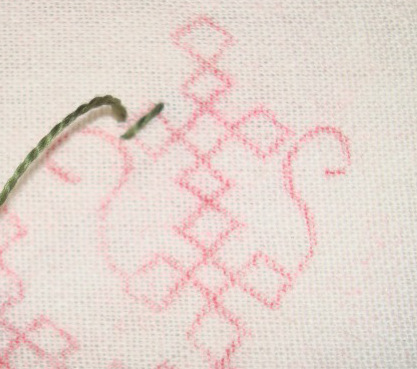 Started with anchoring the main border in another colour thread. Just move along the points. Remember to go over and under the thread alternatively. Both sides of the border is left incomplete in this pattern, we are crossing over to other side because of this. 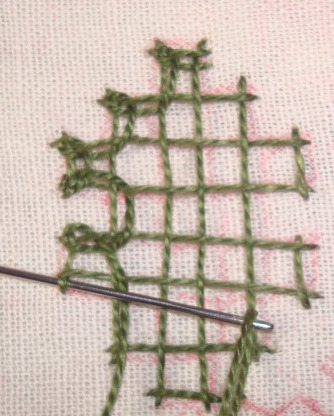 Maintain the same rhythm on the anchoring stitch and move along the pattern. We have completed the outline. The remaining points inside the square needs to be worked. 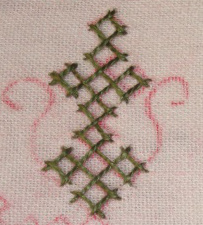 A note- when working on this border continuously, each and every square needs to be worked separately , the connecting line of kutchwork between the top and bottom gets worked like that. All the points are covered. 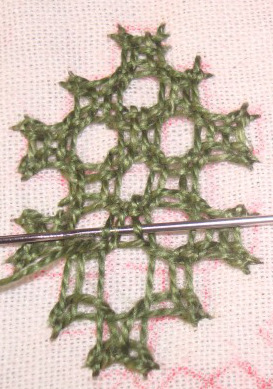 For interlacing again the inner side of the square needs to be worked separately. The picture shows that. 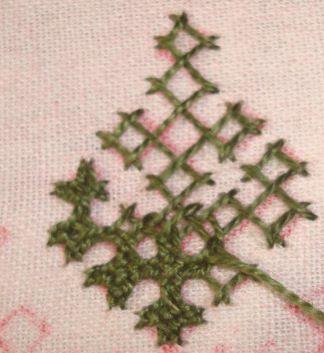 We can continue the interlacing on these stitches now. There are two parts in this border. 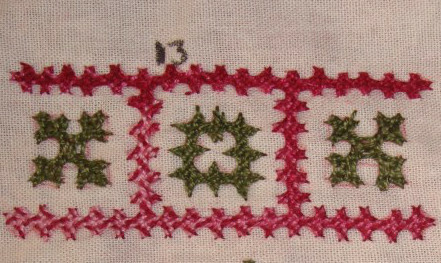 The patterned line and motif. While drawing the motif, I tried it in three different ways. 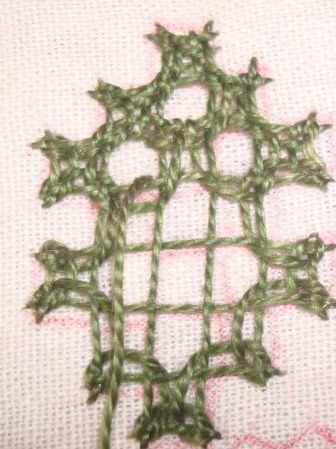 We’ll see the different motifs first. 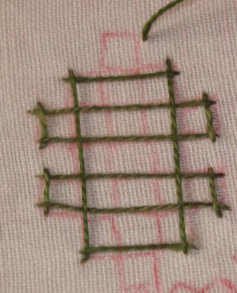 The anchoring stitch is worked as bars [rectangular or ablong?] for this motif. Starting with the smaller ones. When working the bars, remember to move up and down the previous lines alternatively. It is better to work the smaller bars first, otherwise the long bars tend to sag when worked in the beginning. Outer side gets interlaced automatically. 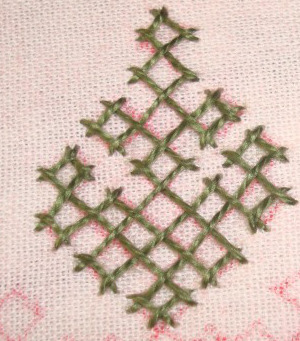 This motif can be worked in two ways, one, where it is completely woven and the second one, where we have spaces. This motif has spaces in between. The interlacing thread goes around these spaces. A space- which is surrounded on all four sides by kutch work squares. The first space is the middle square in the second row from the top. We go around it by interlacing the remaining sides of the surrounding squares. The second and fourth squares form the spaces in the third row, the interlacing is done around them. The central square in the fourth row and the second and third square in the fifth row form the spaces. And the interlacing is being done around them. 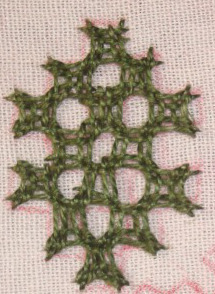 The completed motif after the interlacing. 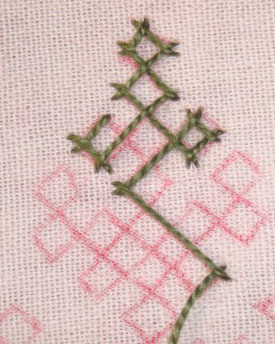 The route of the anchoring stitch. 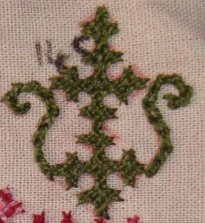 Following the pattern, the anchoring stitch is continuous in this motif. 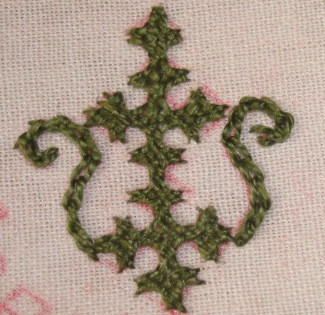 The anchoring stitch is completed. Remember the basic rule of moving up and down alternatively whenever you cross a line. 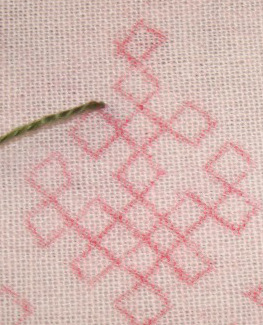 This motif can also be woven where there are squares with common boundaries. But this motif has spaces, so we interlace around these two spaces first. 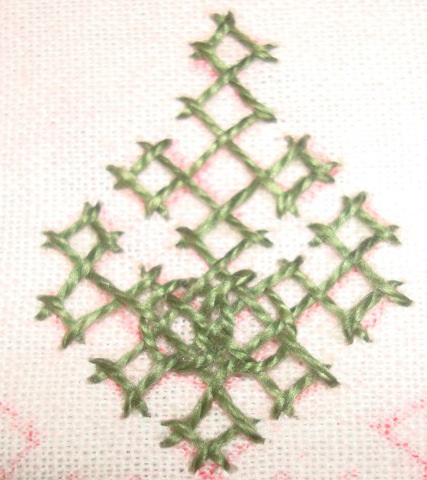 After this it is simple interlacing, this is continuous for this motif. The pattern for this motif. 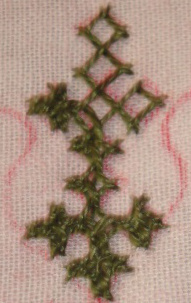 The anchoring stitch is simple for this motif. 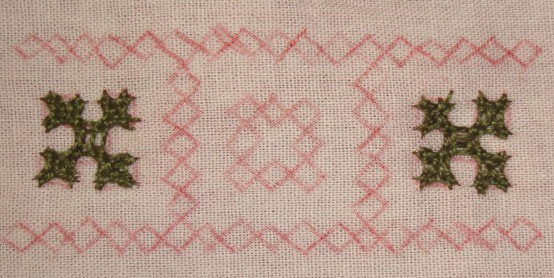 This motif is actually a border extended with lines to create a motif pattern. The interlacing is also simple. 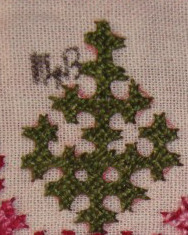 The motif is completed with chain stitch. 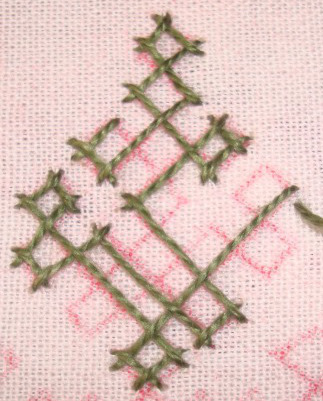 The anchoring stitch is fairly simple and goes continuously, meaning that we start and finish at the same point and this border does not require any extra anchoring, every point is covered. 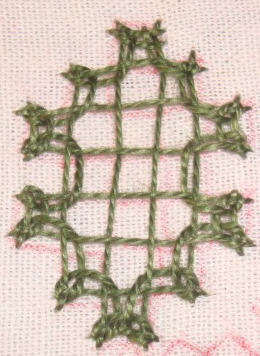 A part of extra element on the border is worked on the onward journey and the highest point gets stitched during the return journey. 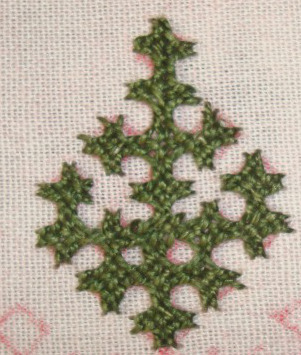 The cross stitch pattern, from which this border was inspired does not have any space in between, so I chose to weave through this border. 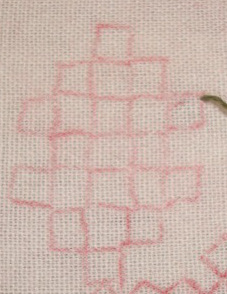 When reaching the extra part of the pattern move ahead and weave through the squares. 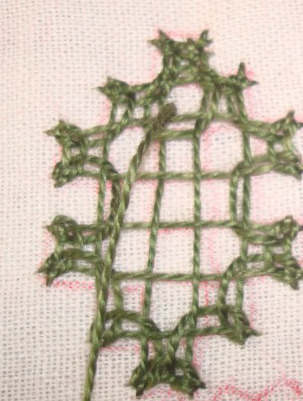 By weaving, we avoid the extra interlacing too. 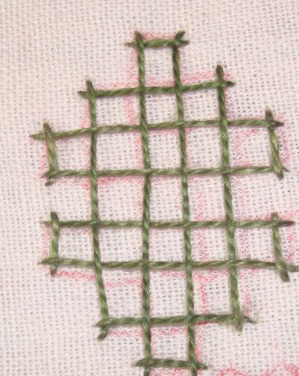 We move along the pattern and weave through the lines, I have explained these steps on my other woven kutchwork tutorials. 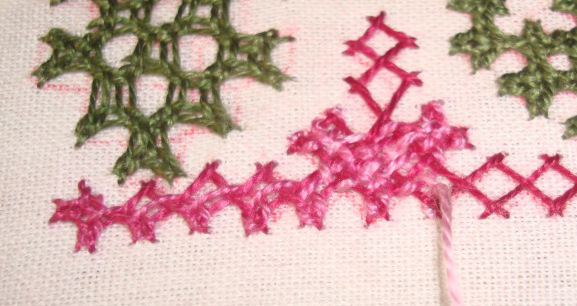 Now we move on to basic interlacing on the border. Notice that the two squares on top are interlaced while returning back.